It was initially hard to fathom the disqualification of our women’s 4 x 100 metres relay team on a lane violation; luckily just a few minutes later there was some jubilation for Team Bahamas at the 14th IAAF World Championships when the men’s 4 x 100 metres relay team broke the national record for the third time this year. The quartet of Adrian Griffith, Warren Fraser, Jamial Rolle and Shavez Hart stood as the last chance for the Bahamas to get a medal on the final day of competition just after the team of Sheniqua ‘Q’ Ferguson, Shanuae Miller, Cache Armbrister and Debbie Ferguson-McKenzie were disqualified as the winner of their heat after it was discovered that Ferguson stepped on the line on the first leg. Running 38.70, the men’s 4 x 100m relay team shattered the previous record that was set by Griffith, Rolle, Trevorvano Mackey and Hart when they won the gold medal at the Central American and Caribbean Championships in Mexico in July. Without the services of Mackey, who was withdrawn from the team prior to their arrival here because of a doping violation, and the absence of premier sprinter Derrick Atkins, who is nursing a back injury, the quartet put their best feet forwards and picked up a sixth place in their heat that was won by Germany in a season’s best of 38.13. 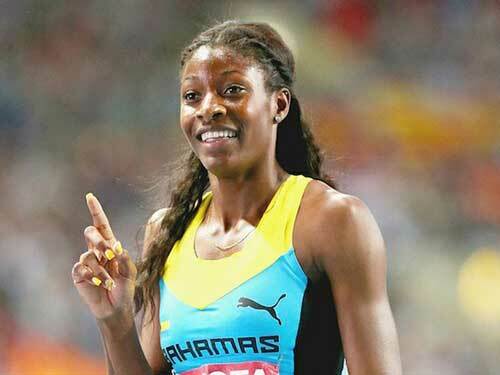 The Bahamas finished 14th on the list of performances led by the United States with 38.06. The eighth and final qualifier was the Netherlands, who got third in the Bahamas’ heat in 38.41. That brought the curtain down on the Bahamas’ appearance at the championships, marking the first time since 1993 in Stuttgart, Germany that the aqua, gold and marine uniform did not ascend the dais to receive a medal. Going into the final of nine intense days of competition, the Bahamas was sitting tied for 30th place with seven other countries on the placing table, thanks to Miller’s impressive fourth place in the women’s 400m and Donald Thomas’s sixth in the high jump. Hopes were high for the women’s 4 x 100m relay team, and a possible resurgence of the Golden Girls, so the disqualification was a big blow, as was the men’s 4 x 400m relay disappointment for Chris ‘Fireman’ Brown, Wesley Neymour, LaToy Williams and O’Jay Ferguson after they failed to get into the final. This was perhaps the biggest shocker of all, despite the fact that Brown ran without Demetrius Pinder, Michael Mathieu and Ramon Miller – all injured – from last year’s London Olympic Games gold medal team.